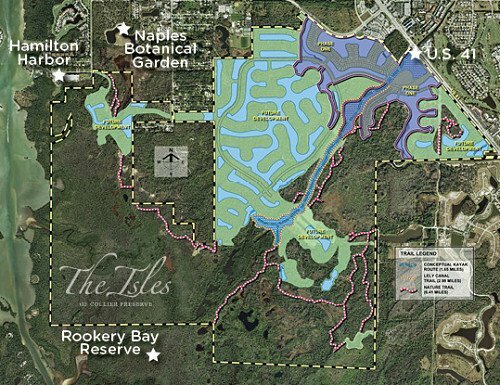 The Isles of Collier Preserve is a new construction community located off US-41 in East Naples, FL. New homes and condos are currently being constructed. Several homes are ready to move in and others must be built. The Isles of Colliers Preserve is a gated community that will have 1,600 single-family and coast homes (condos) when completed. The architecture of these homes harkens to a time when Naples was a small coastal fishing village. Tin roofs and coastal accents combine with modern building features like impact windows resulting in a Florida lifestyle like no other. The community was designed to integrate with the natural setting of preserves and waterways that make the Isles of Collier so special. Nature is the key ingredient to the lifestyle you will experience as a homeowner at the Isles. More than half of the 2,400 acres is pledged to remain natural. Without any golf course in the community, preserves and habitats for native wildlife will be the focal points of walking trails, bike paths and waterways. If you like to hike, kayak or paddleboard in a natural wetland setting, the Isles of Collier is your paradise. Kayaks and bicycles are freely available to residents. Take a kayak tour all the way to Naples Bay or ride a bike through miles of scenic trails. The opportunities for an active lifestyle are almost endless. With such a natural, wetland setting, you would think that the Isles of Collier was in the middle of the Everglades–far from it. The Isles of Collier is just minutes from Old Naples and the beaches that make Naples, FL such a desired destination. Many residents have already moved in and other homes are under construction. Call White Sands Realty (239) 417-1115 for a private tour of the models at Isles of Collier. Brochures with pricing and home specs are available now. Hi Barbara: We had a customer build a beautiful home in Isles of Collier Preserve,”ICP”. Not long after closing, we helped them acquire a nearby deep water boat dock. Isles of Collier has several water sports opportunities. If you Kayak, you can almost make it out to the gulf in the main community natural waterway. Their are plans, apparently already approved by the county, to extend the waterway to the gulf. Also, ICP has, among others, close relationships with the Hamilton Harbor Yacht Club and Windstar on Naples Bay, which is where our customer wound up getting his dock….bigger than his current boat…. so he can naturally argue for a larger one!! We’ll contact you separately about seeing ICP. All the best. Sounds interesting. Would like to see this community.